Cupcake Day #2: Marshmallow Cupcakes. It's Day 2 of my week-long bake off (with myself?!) 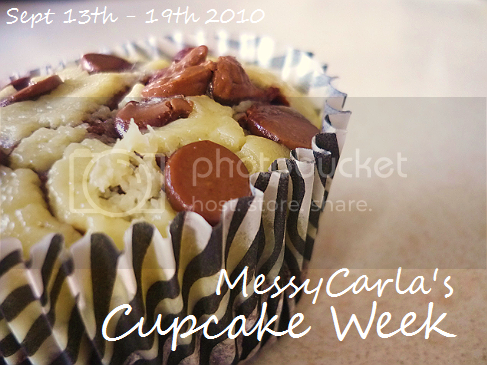 for National Cupcake Week. 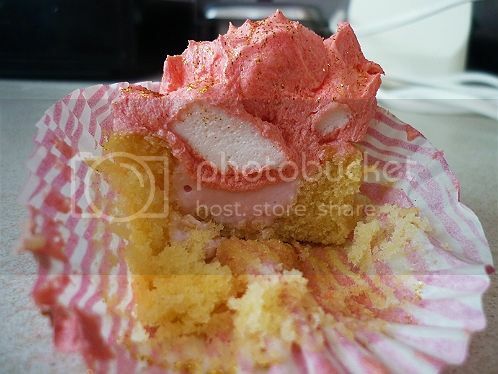 Today's recipe is also from The Hummingbird Bakery cookbook - Marshmallow Cupcakes. I did tweak it a little by adding pink food colouring to the icing, and I couldn't find mini marshmallows so I just chopped up some big ones. Also, put a few less than recommended in, as the frosting recipe I used was already very sweet and rich. The vanilla sponge is light, fluffy - and goes wonderfully with the molten marshmallow. 1. Preheat the oven to 170°C (325°F) gas 3. 2. Put the flour, sugar, baking powder, salt and butter in a freestanding electric mixer and beat on slow speed until you get a sandy consistency and everything is combined. Gradually pour in half the milk and beat until the milk is just incorporated. 3. Whisk the egg, vanilla extract and remaining milk together in a separate bowl for a few seconds, then pour into the flour mixture and continue beating until just incorporated. Continue mixing for a couple more minutes until the mixture is smooth. Do not overmix. 4. Spoon the mixture into the paper cases until two-thirds full and bake in the preheated oven for 20–25 minutes, or until light golden and the sponge bounces back when touched. A skewer inserted in the centre should come out clean. 5. Leave the cupcakes to cool slightly in the tray before turning out onto a wire cooling rack to cool completely. 6. Put the medium marshmallows in a heatproof bowl over a pan of simmering water. Leave until melted and smooth. 7. When the cupcakes are cold, hollow out a small section in the centre of each one and fill with a dollop of melted marshmallow. Leave to cool. 8. Stir the mini marshmallows into the vanilla frosting by hand until evenly dispersed. 9. 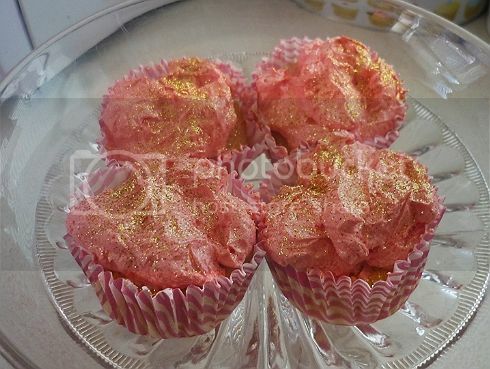 Spoon the frosting on top of the cupcakes and decorate with edible glitter. The only problem I have is that they are EXTREMELY sweet - if you're making these as a gift, make sure the person has a massive sweet tooth. Be prepared for a rather epic sugar rush. I took a BIIIG batch of cake into the office yesterday to cure our Monday Blues - they had all been completely devoured by 10.30am. I hope you all enjoy this series - I promise I'll still blog some fashion-y stuff as well! If you missed yesterday's recipe of Black Bottomed Cupakes, please give it a clicky-clicky? I would like to know from where you got the glitter? 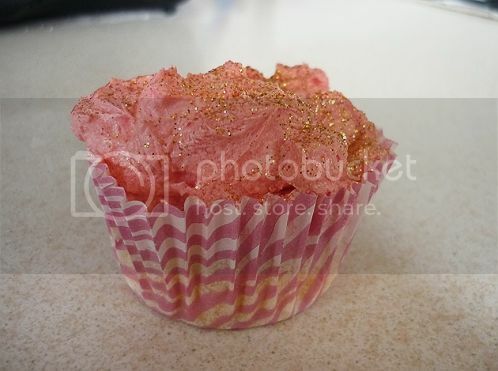 I never saw eatble glitter everywhere, but I would looove to get some, it looks so sweet! aww wow they look so yummy! These cupcakes are way too cute! They're pink and they glitter! Now I wish I have an oven to try and churn out such loveliness! CUPCAKE HIATUS! & The Look Show. Cupcake Day #3: Rainbow Cupcakes.